The question in the title came to me in an email, but for every email I get there are probably hundreds asking the same question in Glennallen. Sure, there are thousands more asking it about where they live, be it Fairbanks or Juneau or Orlando for that matter. But I want to look at what appears to be a unusually cold spot this winter, the capital of the Copper River Valley, population, after throwing in close neighbors Gulkana, Gakona, Copper Center, etc, of a 1,100 or so very tough Alaskans. Let’s look at the weather depiction map from yesterday Morning, courtesy of the Alaska Aviation Weather Unit. A great example, as Gulkana (that’s where the weather station is located), labeled with its 4 letter code PAGK, was the colder than any station except Northway (PAOR)! It was 40 below (Fahrenheit or Celsius, take your pick), colder than Fairbanks at the time and most of the rest of those off the map to the north. Those around it are way warmer, with only Eureka (PAZK) being in the same ballpark. Talkeetna (PATK) and Anchorage (PANC) are not even below zero! Are not all these places in the Southcentral zone? There are two factors at work here. One is the weather. It is cold in Glennallen, and it has been colder than usual there this winter (but not only there). They have garnered the state cold spot award more times than usual this winter. The other is perception: it surprises people how cold it is because they think it should be warmer because of where it is located. What should strike you is the massive mountain barrier along the south coast. This coastal mountain range ranks high among the tallest, most abrupt and least breached coastal ranges anywhere. This wall blocks most of the low-level flow. In summer this flow is mostly from the south, and is moist and somewhat stable. Most of it can’t get inland, and what does dries out a bunch in the process. This is why Glennallen and other interior places enjoy dry, warm summers. In the winter, when the flow is almost always offshore, and the dry, cold arctic air is extremely stable. Because it is so stable it is not easily pushed over the mountains, and the blocking effect is almost absolute. In this situation, gaps in the barrier–the few passes and valleys that breach the mountains–are the main pressure relief valves. The air rushes through these gaps, such as the Copper River Vally and Thompson Pass to name the two most consequential to human activities, and out to the ocean. But these spigots are not enough to prevent the pressure from building up behind the barrier. As this inland high builds, it can push and hold the arctic air all the way to the mountain barrier, not only unwarmed by the proximity of the Pacific Ocean heat source, but continually cooling via radiation to space. Thus the domain of the continental climate is allowed to get very close to the ocean. This is why Glannallen’s climate is solidly continental (despite that you might see it elsewhere lumped in with Anchorage or Valdez in a “Southcentral” or “transitional” climate zone). Look again at the Google map. Not only does Glennallen have the Chugach Range to the south, but it is has the Wrangell Mts to the east, the Talkeetna Mts to the west and the Alaska Range to the North. It’s ringed with large mountain ranges! That’s why the region is usually referred to as the Copper River Basin. Talkeetna, by way of comparison, though more northerly, is not nearly as continental because southerly flow can affect it via Cook Inlet and the Susitna Valley, which is wide open compared to the Copper River Valley (gorge might be better word). Another important factor in frigidity is the local topography…not large mountain ranges, but the actual elevation of a place and its elevation relative to nearby places. The first because high elevation stations tend to be colder due to less moisture and lower air density, and the second is that cold air pools in relatively low areas. Well, Glennallen does well on both accounts. At around 1570 ft (~480 m) it is, despite being in a “basin”, one of the higher elevation towns in Alaska. On the relatively low spot criterian, it is so on a larger scale and less so on a small scale. The town and airport weather station are on raised bluff, well above the river itself. There are those that live in the lower lying areas however, and they probably are aware of the colder winter temperatures, especially on clear calm nights. A year-matched comparison between winter lows at Gulkana (1570 ft) and nearby Gakona (1460 ft and not up on the bluff) shows the latter more than 2 degrees colder than the former. That’s averages over all kinds of weather, so those calm, clear nights have to be that much colder in Gakona, and other places more in dips or valleys. One more thing: truly calm conditions really let the temperature drop, while even a few knots of wind stirs up the air enough to keep the temperature up a few degrees. This is one reason why Eureka is warmer on the map above and probably most of the time. It is in a pass rather than a basin and at the time of the map had 6-8 kts of wind compared with Glennallen’s 0-3 kts. Microclimates at work. Look back at the first map where I declared that Glennallen was the 2nd coldest station on the map. But note the lack of reports east of 145W longitude. Not many people live out in those wild mountains. The point is we have few weather stations in Alaska, especially in the sparsely populated areas. And quite a few important stations do not show up on most maps or listings, usually because they only report once a day (climate stations) or they are unofficial reports from DOT or another agency with no formal crossover with the NWS network. So a cold Glennallen sticks out like a sore thumb, when in reality its not necessarily colder than many places in the region. Thanks to the Internet, it is getting easier to find the “hidden” weather stations (the missing ones are where there really is no reliable data, and too many of those holes still exist). Look at the “mesonet” map below showing 24 hr lows. There are quite a few places around -40 or colder. Also note that while Anchorage doesn’t look too bad on the first map with +4F (-20C) (and an overnight low of -11F(-24C) registered at the Airport), in East Anchorage where the bulk of the population lives, out of the stirring wind lows were as low as -24F (-31C). To get to this map live go to http://pafc.arh.noaa.gov/mesonet.php and click one of the “Mesowest map” links in or at the bottom of the table. When the map comes up mouse rollovers will give you the station name and other info. This is good progress but it still does not access all the stations. You may note that this is the first blog post since late August. I have not posted a summer review (cold) or a winter forecast (colder) as I had advertised. It is not for lack of desire, but family medical needs came up suddenly that took priority over many things, and the blog had to wait. The publishing and order fulfillment part of the business continues, and other parts are picking back up. I do hope to write more often, and one of my new year’s resolutions will be to learn to write shorter, more frequent posts (that’s what blog is all about right?) I value your feedback and hope you will write in with questions and comments. It’s great to see you back. I’m very sorry to hear about the family emergency and hope that everything is well now. Your updates here were missed and I look forward to future posts. So far it’s been an interesting winter in Alaska! 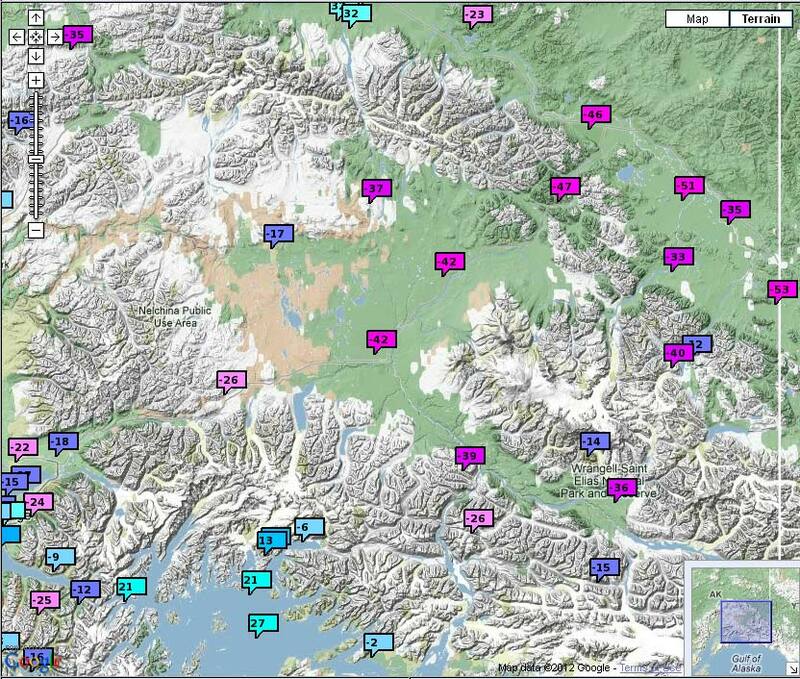 Are you familiar with Rick Thoman’s blog on interior and northern AK weather? It’s very entertaining for weather enthusiasts and contains a wealth of meteorological insight. Family is first! I always check up on this blog, even from down here in Washington state!